This is me, committing to my role as a copywriter for photographers. I’ve been writing websites for the past 4 years. I’ve worked with almost 100 clients. WUT. And yes, this is the first time I’m talking about it. I’ve been so busy doing the actual work that I haven’t been able to share any of it. I’ve learned a ton along the way and it’s time to share the things that might be helpful to other small business owners. Welcome to my copywriting world. I’m ready to answer them. Copy is words. Specifically, it’s words that are trying to sell you something. Anything. You see it anywhere and everywhere, all day every day. You see it in your inbox and on your cereal box. You see it on billboards and in board rooms. You see it on-line and while you’re in line (ya know, like anywhere). We see about 5,000 ads per day—most of those have copy. 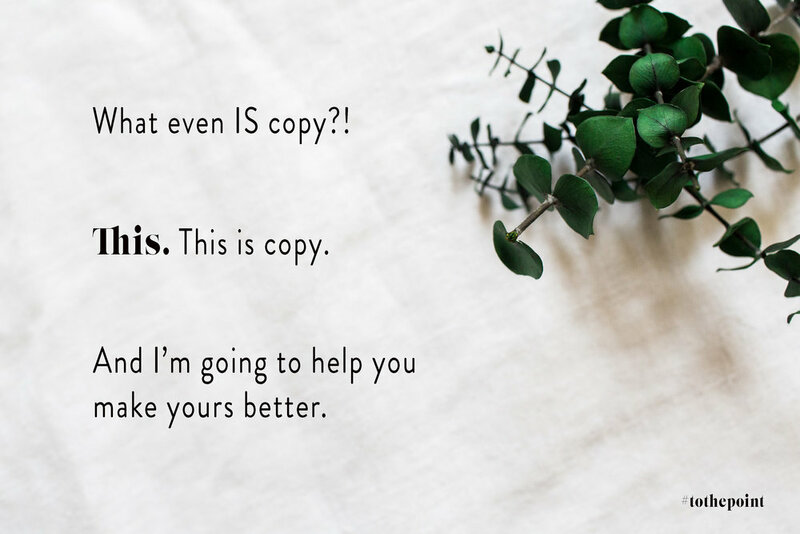 I write a very specific kind of copy: web copy. I write websites for other creative small business owners. Mostly photographers, but some designers too. While websites aren’t traditional advertisements, they are absolutely trying to convince you to buy something. If you’re one of these small biz owners I’m talking about, you write copy all the time too. And maybe you didn’t even realize it until right now. While I want to help you be intentional, I also want you to sound less like a stuffy business robot and more like yourself. I want to help you write copy for your own website and the things that get people there. I want you to sound like yourself, but like, the best version of yourself. My first piece of advice to stop treating writing like a chore. Writing is like speaking. Do you have thoughts? Original ones? Write them down exactly as you would say them. And then edit it to make sense for a reader. There, you just wrote some good, genuine copy. I have a lot more advice to give in the coming months. Ask me any question you have about copy or writing for your business and I will do my best to answer. If I don’t have the answer I will find someone who does.